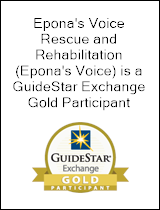 Epona's Voice is a Non-Profit Corporation with 501(c)(3) Status. All Donations and contributions are Tax Deductible and help us operate functionally. Horses have always held a place in our hearts and always will. 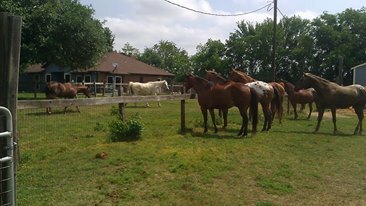 It grew to be a great passion after working with rescued horses and other animals. It is truly unbelievable how an abused animal can ever trust a human after being neglected and abused but will give you love and affection after helping them as though to show appreciation. That is true compassion, its a remarkable thing to witness. Being from the horse capital of america, Kentucky. Family had horses that showed in fairs and shows but it was until coming to texas did the passion grow to what it is today. Rescues are all through the families involed, anywhere from dogs, cats and rabbits to strays on the streets. Animals hold a special place with us and always have, helplessness needs compassion. That's what keeps us up at night and wakes us up in the morning. We will strive to end abuse to the American horses and shut down the slaughter pipeline. Until then we will care for the horses in need. 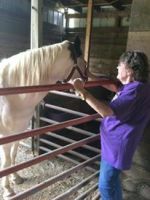 The woman that rehabilitated this horse back to life is where we get our inspiration. Working with her horses and learning what they are capable of even after being tormented and abused is where the passion ignited. Helping animals have always been second nature but the joy that comes from horses is all together a different feeling. 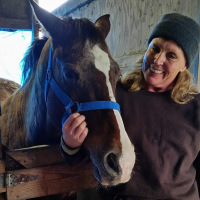 Thanks to Habitat for Horses for the placement and funding to help this horse, she lives out her life enjoying green pastures and love that she definitely deserves. Please be advised, some of the pictures are not for the weak hearted. They are very graphic but tell a big story.